A film with heart and humour, and a 30 year old living in his Mum's basement! Small Indie Comedy Jeff, Who Lives at Home follows the story of Jeff (Jason Segel, star and creative behind The Muppets), a 30-something who, as the title suggests, still lives at home with his Mother Sharon (Susan Sarandon). As Jeff stumbles his way absentmindedly through life, his successful brother Pat (Ed Helms) is struggling to cope with a marriage crisis with his wife Linda (Judy Greer); could Jeff's positivity, laid back attitude, questions of life and his unique takes on world around him, and Pat's contrasting down-to-Earth, stubborn attitudes be what each brother needs to help these two lost men find a way out of their problems and straighten out their lives? With today's output of Hollywood comedy films often going for full-on gross out humour in order to entertain its audiences, it can often be hard to find a comedy film with both heart and humour. Jeff, Who Lives at Home fills that void with a film that will make you laugh out loud one moment, then emotional the next; whilst leaving you to genuinely think about the questions on life raised by Jeff's unique and quirky ways of seeing the world around him. The titular character of Jeff, who despite being a drug abusing louch who wanders aimlessly through life, exerts an abundance of likability thanks to a fantastic performance from Segel, who brings true emotion and life to his character, making him one of the most likable characters in film since Forrest Gump. His hilarious antics, unusual persona and his perceptions of life and the world around him often had the whole audience in stitches. This goes the same for scenes with Jeff and his brother Pat; where fast dialogue and slapstick moments thoroughly entertain, whilst presenting a strong brotherly relationship through their touching on-screen chemistry which drives the film throughout. Susan Sarandon's performance as the mother figure provides an interesting sub-plot that is as engaging and funny as the main plot between the two brothers, often at times providing a nice additional comic interlude to break up the brothers' scenes whilst helping the film to flow much smoother. Whilst her story perhaps isn't as prominent or important as Jeff and Pat's, it does bring humour and warmth with it, as well as tying in nicely to the whole film and its ending, which without spoiling anything could have you on the edge of your seat for the lovable Jeff. This particular scene at the film's climax provides a nice way to summarise the entire film; as a sequence that one moment had the whole cinema engaged and silent in an emotional scene, suddenly followed by the audience bursting into laughter within seconds. This skillful mixture of comedy and drama is the film's strong suit here and throughout, and is what made me leave with a smile on my face and a spring in my step. Jeff, Who Lives at Home is a fantastically humorous and heartwarming story, with brilliant acting from Segel, Helms and Sarandon in performances that convey both the comedy and heart of the story and their characters, all of whom are relatable, likable and engaging. Whilst last weekend's big budget release of Avengers Assemble showed us that sometimes bigger can be better; Jeff, Who Lives at Home proves that sometimes even the simplest of films can move, entertain and have the biggest effect on us. 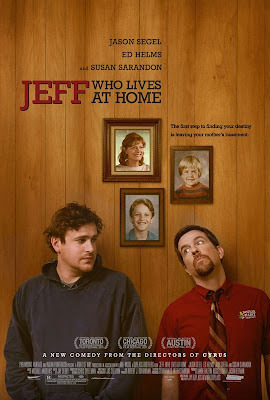 Jeff, Who Lives at Home is released in cinemas across the UK on May 11th 2012. Will you or have you seen the film? What do you think of the film? Leave your comments below! Really want to see this film. Looks like a good comedy.